I guess it’s not much of a surprise that geometry was my favorite math class. That was the one non-art class that I could make good use of my visual skills. Some classes that were easy were also boring to sit through but geometry was easy and fun. Equilateral triangles provide a clearer sound. Scalene triangles are better though. I like right triangles myself. Biff should play a pentagon. But yeah, geometry was my favorite math class too… I averaged something like 103 in that class. I was never into triangles much, always preferred the cowbell. I always preffered playing the circle. By that, I mean Osu. 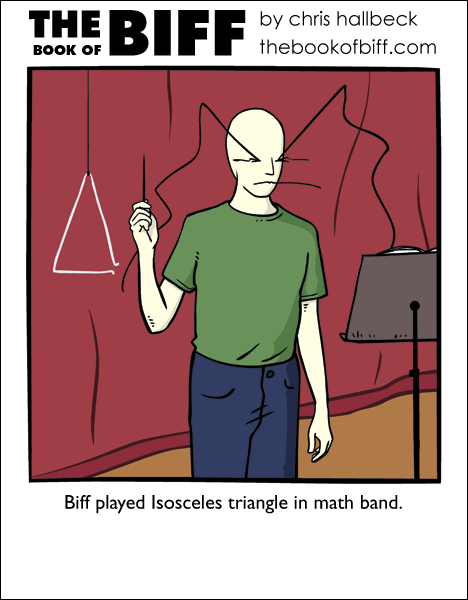 actually, the first triangles were isosceles. I was reading yesterday about it on wikipe…..erm, in town doing normal things. Personally, I preferred the Trombone. Right now I like my RockBand. I FINALLY got through the archives, I read about half of them forward, then the rest backwards. Not too sure why, but they’re done. Can’t wait for each updated. Keep up the amazing work! Kudos! I always preferred the regular seventeen-sided polygon, myself. Yeah, I liked construction… Drawing in math class? You betcha! That’s not the animation playing the music, that’s the music controlling the animation. Exhibit B: Guitar Hero. Need I say more? Exhibit c: Like I said earlier, osu. You know if they ever made Tuba Hero I would be awesome. Perhaps then I could 5 star all the medium songs and do decent in the hard levels. One can keep up hope…. right? I prefer the dodecahedron… Who cares if it`s three-dimensional, I`ll still play it, damnet! @Coughman: I completely agree with you. @RG: At my school, band geeks don’t really exist because the cool kids ARE in the band (including me, of course)! I’m doing triganometry right now. Right angles triangles sure beat using the cosine law. @Chris (the other one): MORE COWBELL! A dodecahedron is a 2D 12-sided figure. I’d prefer the Icosahedron: 20-sided 3D shape made of equilateral triangles. Today we will be playing Pythagoras’ 5th Symphony in c². I assume you are referring to the Baritone? @Qskecksget : No, a dodecaGON is a 12-sided 2D figure. DodecaHEDRONS are 3-dimensional 12-faced shapes. @Zaffa: the ones with pentagonal or triangular faces? Math + Band = WTF~! Yeah Geometry was the only math class I ever enjoyed and thought easy. Ironically most of my classmates thought opposite. oh, just a sec, dodecahedron is taken…. If you ever look at old comments anymore….look up Gossamer Wump!